Forget the PJD7830HDL's lacklustre blackout performance; anyone interested in home cinema perfection will just have to pay more. This cost-effective DLP all-rounder is firmly aimed at the use-it-anywhere crowd, which all projector makers must surely aim for to popularise the practice of watching truly big-screen movies and games. Dedicating an entire room to a home cinema/home theatre is overkill for most people. So is the idea of spending big on a home entertainment set-up that may only get used occasionally. Cue the growth in popularity of projectors like the PJD7830HDL, which is based upon designs for a business projector for the boardroom, but which has enough colour nuance to cope with movies and games on a bigger screen. It's so obviously au fait with the business world; as well as having a built-in speaker to help with multimedia presentations, the PJD7830HDL manages an eye-popping 3,200 ANSI Lumens of brightness, which is twice that of super-serious (and super-expensive) dedicated home cinema beamers. That brightness alone doesn't make the PJD7830HDL usable in daylight – a quoted 22,000:1 contrast ratio ought to prove just as important – though together they should make this single-chip DLP projector highly versatile. So too that internal speaker, which reaches an unheard of 16W power. However, the PJD7830HDL is all about price; selling for just $1,149 (£579, AUS$1,230), this is an attempt at an everyman projector that can swap easily between home and office. This projector is clearly designed to cope with anything, anytime, and look good while it's doing it. Measuring a highly portable 254x152x254 mm and weighing 2.8kg, the PJD7830HDL boasts a curved all-white chassis that refuses to be ruined by unsightly cables; there's a flap on the back to hide its ins and outs. The connections panel on the rear gives away the PJD7830HDL's lofty ambitions, with a single HDMI slot joined by composite video, dedicated audio minijack ins and outs, an RS232 slot and a D-sub 15-pin to attach a laptop or PC, and even a monitor output. That collection seems heavily bias towards the business world, but luckily there's a second HDMI slot under a (tricky to remove) hood on the side of the projector that's specifically there to take ViewSonic's WPG-300 ViewSync 'wireless presentation gateway' HDMI dongle that means the PJD7830HDL can talk to phones and tablets. Ditto 3D, for which you'll need a pair of PGD-350 3D active shutter glasses. Set-up is reasonably easy using the 1.36x optical zoom and manual focus rings, though I had to use a bit more keystone correction that I wanted to to get a dead-on 80-inch image. The way the remote is configured makes the PJD7830HDL seem rather obsessed wth keystone correction, which is more bad news for those after a projector primarily for home cinema. It's not often I've said this about a projector (read: never), but the most impressive part of the PJD7830HDL is actually its audio. 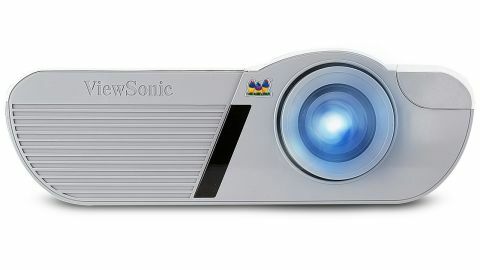 A powerful SonicExpert speaker is housed on the projector's side, and though it's mono it's by far the most advanced stab at sound from a projector yet. The 'standard' and 'speech' presets are disappointing – the latter very tinny – but the 'entertainment' option provides enough bass and mid-range to watch a movie. OK, so it's no substitute for a surround sound system - there is a little hiss - and nor is it going to blow any socks off with its musicality, but if you're watching TV, a documentary or gaming it's absolutely fine and goes pretty loud without distorting. Judged on picture quality, the PJD7830HDL delivered just what I expected; bright, colourful and exceptionally sharp Full HD images that are good in daylight and slightly less impressive in a blackout. It's not just that the PJD7830HDL's single-chip colour wheel produced some rainbow effect for me each time I scanned my eyes across the 80-inch test screen (my eyes are prone to it; yours may not be), but the PJD7830HDL's innate brightness comes at the cost of black levels. Dedicated home cinema projectors are routinely about half as bright as the PJD7830HDL's quoted 3,200 ANSI Lumens, and though this DLP beamer never produces spot-on black, its ViewMatch mode lets it get close enough for a nicely priced all-rounder.